The neighborhood generally referred to as "Wash Park" is often broken down into eastern and western sides: not only do both have their own neighborhood organizations and quite-different historical trajectories, but since 1972 official city statistics have tracked Washington Park West as separate from the easterly "Washington Park." 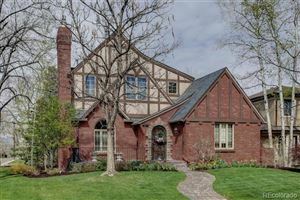 The (eastern) Washington Park neighborhood has borders defined by the city of Denver as Downing Street, Cherry Creek, I-25, and University Boulevard. The public park is located within the neighborhood. The West and East Washington park neighborhoods have two large lakes, ten tennis courts, a large meadow used for lawn sports such as volleyball and soccer, a lawn bowling green, two of the city's largest flower gardens, and its busiest recreation center. Washington Park as a neighborhood started development soon after the founding of Denver though it was still fairly rural in nature. By 1886, there was enough population to create Denver's first suburb, South Denver, which by the silver bust of the 1890s was annexed into Denver due to financial difficulties. Development hastened with the creation of the park in 1899. Most of the houses were built of brick between 1900 and 1940. Washington Park is a very popular urban neighborhood because of its central location, its closeness to the park, and its access to several commercial business enclaves. This has led to a transformation of the neighborhood, which worries some residents because of an increased density, more traffic, and the propensity of some developers to scrap historic homes and replace them with denser luxury duplexes, town-homes, or other development.